Singer, songwriter, saxophonist and guitar player, Curtis Stigers, first made his mark in the early 1990s with chart appearances in the UK, USA and beyond, with songs such as I Wonder Why and You're All That Matters To Me. Since then, he has evolved into an established front-ranker among male jazz-oriented vocalists, alongside Kurt Elling, Gregory Porter and company. Nevertheless, it can be argued that Stigers and the Danish Radio Big Band have taken on a considerable challenge here. This album, recorded in the DR Koncerthuset in Copenhagen, before a live audience, seeks to commemorate the 50th Anniversary of the recording, Sinatra At The Sands, where Frank Sinatra was accompanied by the Count Basie Orchestra, conducted by Quincy Jones. The original was a double album comprising eighteen tracks whereas this tribute offers only ten, seven of which were on the Sands playlist. Given that the Las Vegas hotel and casino date in 1965 (the disc was actually released the following year) is widely regarded as a classic among Sinatra's handful of live recordings, the scale of this new undertaking is apparent. From Sinatra's early days with the Tommy Dorsey Orchestra, he learned a great deal about jazz phrasing and about controlling the breath. His development was to continue to the point where he became the pre-eminent singer of popular music of the twentieth century. The Basie Band are in the pantheon of great jazz orchestras. Arranger, composer, conductor and record producer, Quincy Jones is also a revered figure. At one level, then, Stigers and the band were on a hiding to nothing. Certainly, Stigers is a more hard-edged vocalist than Ol' Blue Eyes and offers less light and shade. He does have a winning way, however, especially on ballads such as Don't Worry 'Bout Me and One For My Baby. As the saying has it, though, 'comparisons are odious'. This seems to have been, judging from the response of an appreciative audience, a completely enjoyable romp through superb material, with quality arrangements complemented by high standards of musicianship. I've already referred approvingly to two ballads. Summer Wind and They Can't Take That Away from Me are in similar vein, each gently swinging, the latter in particular producing an enthusiastic endorsement from the listeners, as does The Lady Is A Tramp. The band contribute a real sense of attack to numbers like Come Fly With Me andFly Me To The Moon. That paean to the city of Chicago, My Kind Of Town, is delivered with punch and panache by Stigers and the musicians. I've Got You Under My Skin is instantly recognisable. The arrangement, as on the Sands album, is based on the Nelson Riddle original, although it is missing the rasping Milt Bernhart trombone input which so distinguished the earliest version. Still, this latest effort retains some of the excitement of that occasion. 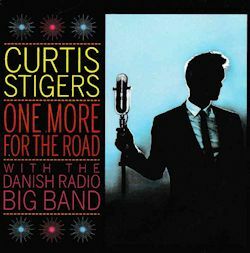 The album, then, has plenty to commend it, especially to Curtis Stigers fans (and there are many) and to those who enjoy a vibrant big band sound. The only draw back is the brevity of the album, at less than thirty-five minutes. It's a pity that more of the Sands playlist wasn't included. I'd have loved to hear whatThe Shadow Of Your Smile, Angel Eyes or Where Or When would sound like from these musicians. Of course, the recollection of these songs may send the listener back to the musical legacy of Francis Albert himself.